Conecsus team in Guadalajara with the award, L-R, Steven J. Butler, Commercial Director, and Laura, Roberto, and Yessica. 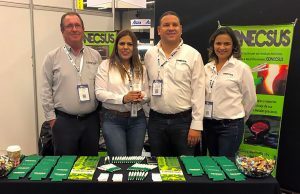 Terrell, Texas, USA — Conecsus, LLC, an innovative environmental technology and recycling company, won a coveted Mexico Technology Award for its unique and innovative metals waste and dross recycling technologies. The award was presented to the company during a ceremony that took place during the SMTA Guadalajara Expo & Tech Forum. cess, wastes typically containing primarily tin, tin-zinc, lead, silver, gold, and copper, and converts them into usable metal products for sale into the global market. The Mexico Technology Awards is a new annual program that recognizes the best new innovations in the electronics manufacturing industry in Mexico. The goal of the award program is to celebrate the companies and people that are achieving the highest standards and driving the industry forward. The awards are designed to promote best practice in the areas of technical innovation and manufacturing quality and productivity.